And now back to Destination Ten. Ready for your next clue? D10 wants to tell you himself, so in the cosmic words of Destination Ten (I just helped with the spelling), here’s your next clue. If you read my Day2 limmeriddle you’ve probably figured out that I’m practically a planet, except for the small detail that I don’t orbit the sun. And then, if you hovered over my photo (not my best side, but still rather attractive if I do say so myself) you discovered that my biggest claim to fame is –ta, daaa–I have an atmosphere. That detail got Earth scientists all excited. So excited that about six Earth-years ago they shot a probe right through my hazy outer veil (talk about tickling–sheesh!). That’s how they found out that my air has a lot of nitrogen in it like Earth’s, which got them even more excited. They do have one complaint, though. They say I’m a little smoggy. But I say, what’s the big deal? So I rain gasoline-like stuff now and then–hey, everyone has a bad air day sometime! Thanks Destination Ten. That was very, uh, interesting. Just for that I’ll show your fans a photo of your good side — here you are going around with your little brother Tethys. This entry was posted in Destination Ten, Saturn, Space Exploration, Space Game, Titan. Bookmark the permalink. I agree with Bird. I think it’s Saturn’s Titan. Very interesting – Archimedes and Bird are in sync on this one. Check tomorrow’s post to see if they’re right! Excellent comment, Bird of the Wind! You picked up on several important clues, I see. Let’s give your fellow Space Bloggers a bit more time to weigh in on this one (though no one’s going to ‘outweigh’ Destination 9!). Check back next post for the exciting conclusion! 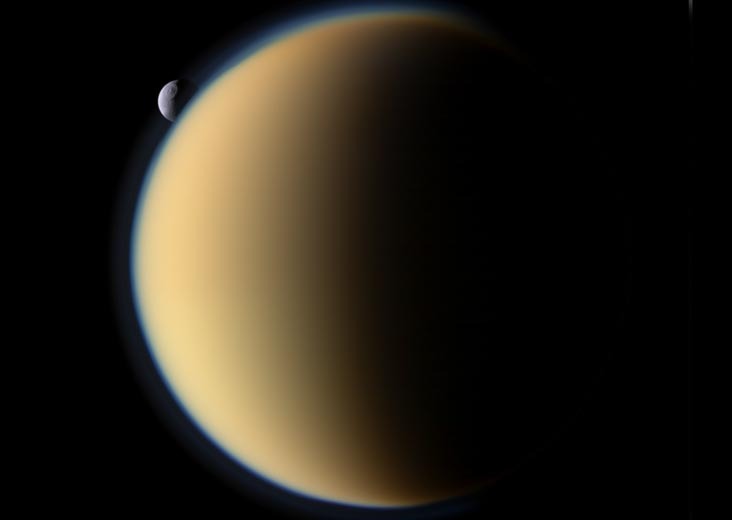 Could the mystery destination be Saturn’s moon Titan? It is comforting to know that even gods have bad days, whatever type they may be.